Katie Thornton demonstrates her patriotism for the United Kingdom in the best possible way. By wearing a Union Jack bikini. What else? Men of all nationalities can definitely jack to that! Katie is up for 2016 SCORE Model of the Year. No simple task. She’ll need to score more votes than three-time MOY winner Hitomi. 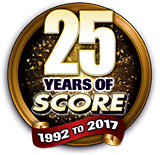 The results will appear in the upcoming June 2017 SCORE, the 25th anniversary issue. In Vanessa Y.‘s new fantasy, she has been having a good time drinking beer with her girlfriends at the local pub. Vanessa enters the ladies room, a real hole in the wall. In fact, there are several holes in the walls, put there so the perv male employees can spy on women on the throne. 2015 Voluptuous Model of the Year Vanessa is on the ballot for 2016. Will she take the title for the second time? She’s up against some very strong candidates, including Anastasia Lux, Alexya and Joana Bliss.